Description: The inconspicuous flowers are followed by bright orange berries. 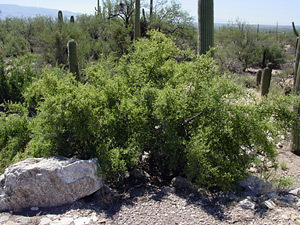 The leaves are green, rough-textured, alternate, oval-shaped, and variable in size. The stems are woody and covered in large, woody spines up to 1 inch (2.5 cm) long. Birds enjoy the fruit and Coyotes (Canis latrans) will eat the leaves. Dogs also will eat the leaves. These plants are available in native plant nurseries. Allergenic – The flowers produce allergenic pollen. Butterfly Plant – Emperor butterfly caterpillars (Subfamily Apaturinae) like those of the Hackberry Emperor (Asterocampa celtis) feed on the leaves, while the adult male Emperor butterflies are often found waiting on the plants for passing females. 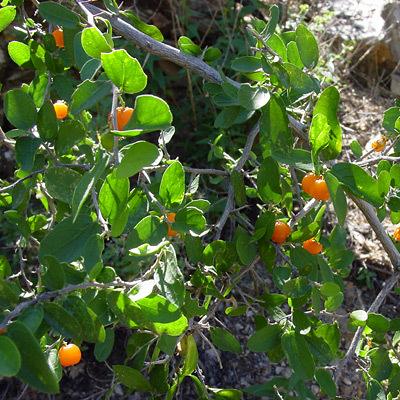 Edible – The ripe orange fruits are blandly sweet and edible, but they are small and seedy.